A week or two ago, I went to see The Theory of Everything at the cinema with my friend, Charlie. I had heard good reviews of the film, but initially had no clue what it was about. 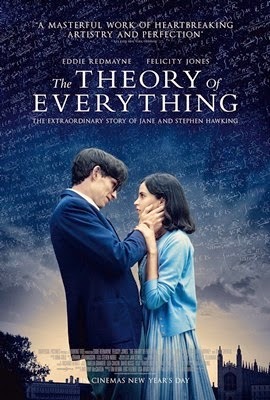 So to arrive at the cinema and find out that it was all about the life of none other than Stephen Hawking, left me with a huge curiosity, but also notable angst. As shown in the film, Hawking has Motor Neuron Disease. This was the reason for my angst. After watching the film, my dad told me that this was why my grandad was unsure of whether he wanted to watch the film or not, and equally I had felt the same (but it was a bit late to back out). My grandma also had MND, and so to watch Hawking slowly becoming paralysed in more and more places kind of broke my heart, because I'd seen it happen before. Nonetheless, despite my own personal added emotions towards the film, I thought it was utterly incredible. I don't think you really, properly realise what any one person has been through until you have it laid out in front of you on a screen. Obviously to assume that the film portrays Stephen's whole live would be very naive, but still, a very vivid picture is painted. I always love learning about other people, especially those who are considered to be of significance, so for me it was ever so intriguing, and, as ever, it sparked me to go away and do some further research into the individual myself. For instance, I didn't actually know that Stephen was born in Oxford, and what with living their all my life, I was shocked I'd never known. To see how Hawking overcame every hurdle he faced was my favourite thing. Of course, at times he was a little downhearted, but he never seemed to accept defeat; he still hasn't. And to think, when he was a graduate student he was thought to have only two years to live, and yet, he's still triumphing today. It's undoubted that the man's clever far beyond I'll ever be, so just to be able to see into his life a little through The Theory of Everything was a wonderful experience. The battles he faced, along with his wife, were immense, and yet, everything has turned out well for them. If you haven't seen The Theory of Everything then I would highly recommend you do. It's something of an emotional rollercoaster, but you'll be glad you've seen it.